SteelSeries says that the Apex M500 tournament-ready mechanical keyboard is now shipping. 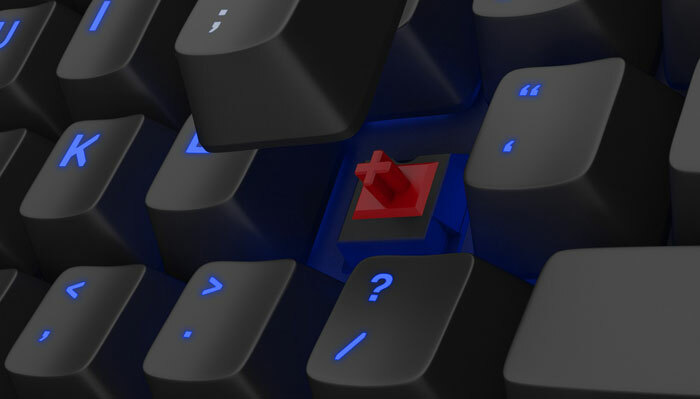 This keyboard is aimed at eSports gamers and comes equipped with Cherry MX Red gaming switches, Anti-Ghosting technology, and blue LED perk-key backlighting. The hardware is enhanced by the SteelSeries Engine customisation software and this minimal durable gaming keyboard has been given a retail price of £94.99 / $99.99. Please note that these keyboards are 'temporarily out of stock' in the UK, direct from SteelSeries, at the time of writing. The SteelSeries Apex M500 is said to use "a traditional key layout for universality" because "if it ain't broke, don't fix it." In the intro you will have noticed that SteelSeries has plumped for another standard with the Apex M500, the use of Cherry MX keys, which opens up a wide choice of alternative keycaps and keycap sets. Furthermore users will benefit from 100 per cent Anti-Ghosting technology with 104 key rollover. SteelSeries beats the minimalistic drum in its promo blurb, claiming that the basic sleek design "gives you everything you need in a professional gaming keyboard, without any of the fluff." Demanding eSports gamers are asked to trust in this device's durability, created "with the toughest plastics and reinforced with a battle-hardened steel back plate." Other design niceties include the blue LED lights beneath every key. SteelSeries provides 3 different breathe settings with 4 individual levels of brightness. While it is a minimal design keyboard SteelSeries has still implemented quick access media keys across the function keys. Under your keyboard there are three cable guides to choose between, non-slip rubber pads, and adjustable height feet. Last but not least SteelSeries Engine software provides "limitless customisation" of aspects such as key assignments, text-based, key and on-the-fly macros with unlimited profiles which can be auto-deployed depending upon games. Looks really good - especially in terms of value. Seems poor value to me (typing on fairly similar £50 Qpad MK-85, tho it was on sale).